Are you frustrated or confused why your cat behaves in certain ways? How do you solve bad cat behavior problems without whispering with them first? Seriously, that may sound funny but the truth is, cats have very unique viewpoints all their own. Without taking time to communicate with them, you can guess all you want to as to why they’ve behaving the way they are but until you listen to them, you won’t know for sure what’s wrong in their world. The art of cat whispering is exactly what’s needed to begin solving cat behavior and even health problem. Is your cat doing any of these things? Hissing a lot for no known reason? Skittish, nervous, spends a lot of time hiding under the bed? Being the classic ‘Fraidy Cat, scared of noises, movement or new things? Acts very aggressive toward other cats or people or…? Finicky and picky eater, throwing up frequency? Hurting you with their sharp claws or teeth? Hiding under the bed or in the closet? Marking the walls, doors, windows, or not using their litter box? Is their coat dull and matted, and they sleep a lot? Does their inner eyelid show when their eyes are open? BEWARE! These are ALL important clues something isn’t right in their world. Wouldn’t it be great if you could get inside your kitty’s head and know what they are thinking and feeling? Listening to their wisdom and understanding their viewpoints can change your life, because once you’ve seen the world through a cat’s eyes? What if you could just ask them to help you? Talk about problems like you’re best friends? And they actually DID exactly that! Amazing. You can have a meeting of the minds and heart, and together decide what’s a problem and why it’s a problem. Remember that what you think is a problem may not be a problem from their viewpoint. And then once you’ve agreed, together you can decide how to best resolve it. If you are a cat parent, then you are undoubtedly aware that feline temperament and characteristics will only go so far in explaining the root cause of behavior issues. NOT answering these questions can CAUSE behavior challenges. If they are not taken care of properly, then things will only get worse. A good cat whisperer will communicate with your cat to answer these questions and that creates clarity for both of you. Your goal is to help improve their longevity, well-being and health and to do that, you want to open your mind and heart and hear their whispers back to you. Did you know your cat can mirror and reflect you? The extraordinary phenomenon of the Human Animal BodyMind Connection between you and your cat means that your cat mirrors your energy, takes on your illnesses and stressors. They are always reacting, resisting or responding to you. That means YOU — your health, balance and well-being — can be the key to creating a healthy, balanced, happy cat… or not. Because of all my years of experience in working with cats, I know how incredibly important it is to first communicate directly with your feline friend. Because until we do, we won’t know what the problem really is, where it’s coming from, and what the unknown factors are that we don’t know yet which are contributing to the problem at hand. We do know that your cat always does what seems right to them — from their own viewpoint. They always do what makes sense to them. In my extensive experience, problems could be coming from a management issue, such as food that’s not right for them, from unknown pain, undiagnosed illness, simple miscommunication or misunderstandings. Until I communicate with them directly, we won’t know specifically how to make it better. 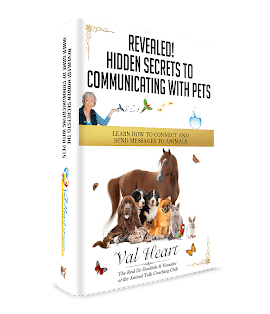 I work with feline behavior modification and healing, working directly with your cat to make sure they are heard and that their concerns are addressed so real changes and healing can begin. Do you want to learn how to be a Cat Whisperer? Yes, you too can learn how! All you need is guidance to help you discover how to open your heart, tune into kitty energy and viewpoints so you can see the world through their eyes. Connect from heart to heart, mind to mind. Cats will love whispering their secrets to you too! 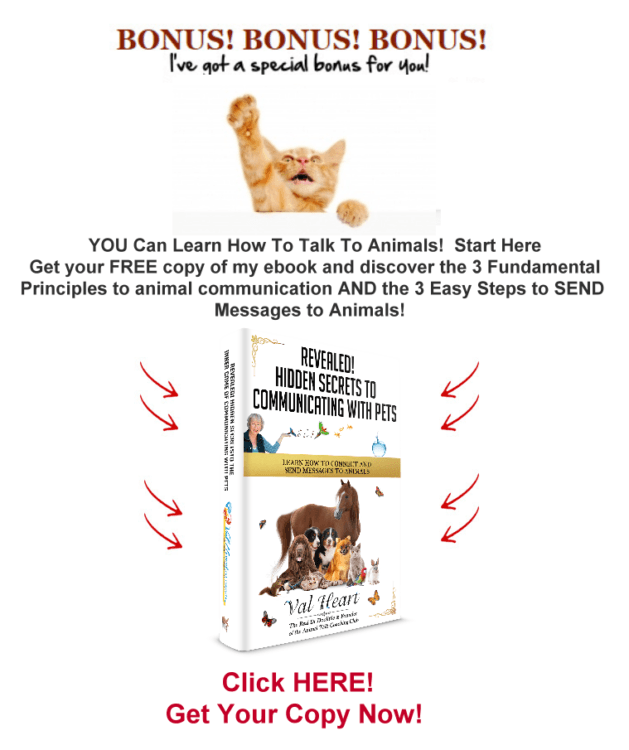 Read more about Animal Whispering — Click Here! Could you use an expert’s help? I can whisper with your kitty for you. Click Work With Val on the menu above. Choose which type of consultation you and your kitty most want (communicating, problem solving, healing) and let’s get started!